I was checking out the Weather Report for Grimsby - warm summer temperatures for the next few days. At the same time, a Weather Report song was on the radio on JazzFM. They regularly play two of the jazz fusion band's songs - "A Remark You Made" and "Birdland". I think it is Jaco Pastorius' bass lines that draw my attention to the songs every time I hear them. Our Canadian Thanksgiving is concluded - and what does every Thanksgiving meal finish with? Of course it is pumpkin pie - it has to be one of the delicious desserts. Pumpkins are a member of the gourd family and are also considered winter squash. The world record for giant pumpkins remains in Germany! For the second time in 3 years, the world record for giant pumpkins has fallen at the European Weigh-Off in Germany. German grower Mathia Willemijn brought this behemoth pumpkin weighing 2,624.6 pounds to the weigh-off on October 9, 2016. Here is a picture of a person paddling on a pumpkin in the water as part of the world record pumpkin pictures. I thought I should insert it as you might not believe it could be true. 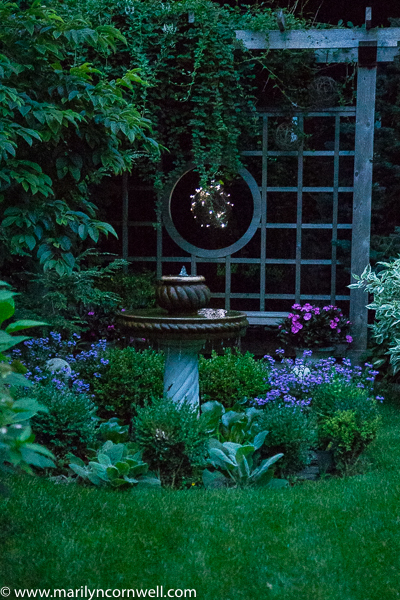 Our picture is shows the garden rendezvous with night lighting, part of my experiments for "The Night Garden".